UPDATE: The time of the Meet & Greet is now from 2:00 – 4:00 PM! 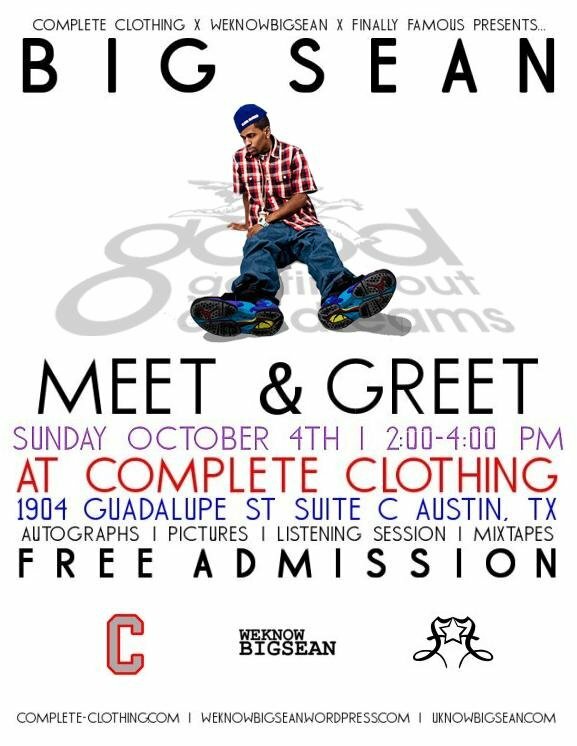 WEKNOWBIGSEAN, Complete Clothing, and Finally Famous are hosting a meet and greet in Austin, TX on October 4th after Big Sean performs at Austin City Limits! Big Sean will be there to take pictures, sign autographs, and hand out hardcopies of his mixtapes. Also, limited Finally Famous merchandise will be on sale too. If you’re in the area (or even if you’re not, its worth the drive!) be sure to check it out! New video detailing Big Sean’s weekend. Take a behind the scenes look at the video he shot in conjunction with Ohio’s Fly Union for their song “Poe’d Up,” his performance at the Sprite Green Event with his G.O.O.D. Music family in Chicago, and the footage of him in the studio spittin’ some bars for his debut album, Finally Famous! Here’s more footage from the Sprite Green Event in Chicago. Big Sean performs “Desire, Want & Need” and “Way Out” with Mr. Hudson. Over the Summer MADonly.com caught up with G.O.O.D music artist Big Sean at the Legendary SOBs. After rocking a jam packed show, Latasha A. Baby had a chance to sit and find out what inspires him as an artist as well learning his opinon on the state of hip-hop! The first part of this video Big Sean speaks on the Floyd Mayweather fight and Kid Cudi’s album, and then briefly talks about the 2 videos he just shot and NO I.D.